Parents should read to preschool children and infor­mally teach them about reading and writing. Reading to children, discussing stories and experiences with them, and — with a light touch — helping them learn letters and words are practices that are consistently associated with eventual success in reading. Parents should support school-aged children’s contin­ued growth as readers. Parents of children who become successful readers monitor their children’s progress in school, become involved in school programs, support homework, buy their children books or take them to libraries, encourage reading as a free time activity, and place reasonable limits on such activities as TV viewing. Preschool and kindergarten reading readiness pro­grams should focus on reading, writing, and oral language. Knowledge of letters and their sounds, words, stories, and question asking and answering are related to learning to read, but there is little evidence that such activities as coloring, cutting with a scissors, or discrim­inating shapes (except the shapes of letters) promote reading development. Teachers should maintain classrooms that are both stimulating and disciplined. Effective teachers of read­ing create a literate classroom environment. They al­locate an adequate amount of time to reading and writing, sustain children’s attention, maintain a brisk pace, and keep rates of success high. Reading primers should be interesting, comprehen­sible, and give children opportunities to apply phonics. There should be a close interplay between phonics instruction and reading words in meaningful selections. But most primers contain too few words that can be identified using the phonics that has already been taught. After the very earliest selections, primers should tell complete, interesting stories. Teachers should devote more time to comprehension instruction. Teacher-led instruction in reading strategies and other aspects of comprehension promotes reading achievement, but there is very little direct comprehen­sion instruction in most American classrooms. Children should spend less time completing work­books and skill sheets. Workbook and skill sheet activ­ities consume a large proportion of the time allocated to reading instruction in most American classrooms, despite the fact that there is little evidence that these activities are related to reading achievement. Workbook and skill sheet activities should be pared to the minimum that actually provide worthwhile practice in aspects of reading. Children should spend more time in independent reading. Independent reading, whether in school or out of school, is associated with gains in reading achieve­ment. By the time they are in the third or fourth grade, children should read independently a minimum of two hours per week. Children’s reading should include classic and modern works of fiction and nonfiction that rep­resent the core of our cultural heritage. Children should spend more time writing. Opportu­nities to write more than a sentence or two are infre­quent in most American elementary school classrooms. As well as being valuable in its own right, writing promotes ability in reading. Textbooks should contain adequate explanations of important concepts. Textbooks in science, social studies, and other areas should be clearly written, well-orga­nized, and contain important information and concepts. Too many of the textbooks used in American classrooms do not meet these standards. 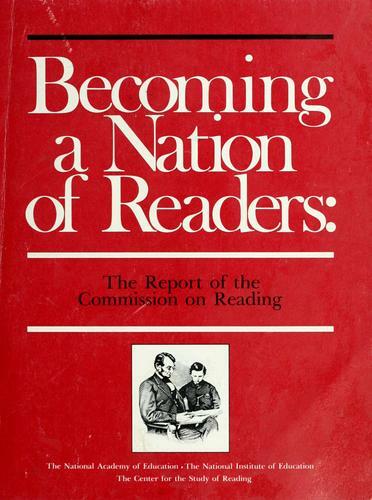 Schools should cultivate an ethos that supports read­ing. Schools that are effective in teaching reading are characterized by vigorous leadership, high expectations, an emphasis on academic learning, order and discipline, uninterrupted time for learning, and staffs that work together. Schools should maintain well-stocked and managed libraries. Access to interesting and informative books is one of the keys to a successful reading program. As important as an adequate collection of books is a li­brarian who encourages wide reading and helps match books to children. Schools should introduce more comprehensive assess­ments of reading and writing. Standardized tests should be supplemented with assessments of reading fluency, ability to summarize and critically evaluate lengthy selections, amount of independent reading, and amount and quality of writing. Schools should attract and hold more able teachers. The number of able people who choose teaching as a profession has declined in recent years. Reversing this trend requires higher admissions standards for teacher education programs, stronger standards for teacher cert­ification, improved working conditions, and higher teachers’ salaries. Teacher education programs should be lengthened and improved in quality. Prospective elementary teach­ers do not acquire an adequate base in either the liberal arts and sciences or in pedagogy. They get only a fleeting introduction to the knowledge required for teaching reading. Teacher education programs should be ex­tended to five years and the quality and rigor of the instruction should be increased. Schools should provide for the continuing profes­sional development of teachers. Schools should have programs to ease the transition of novice teachers into the profession and programs to keep veteran teachers abreast of advancing knowledge. America will become a nation of readers when verified practices of the best teachers in the best schools can be introduced throughout the country.